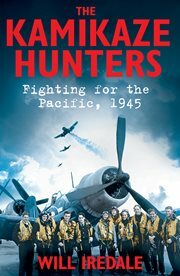 Will Iredale’s book The Kamikaze Hunters tells the extraordinary story of the young British airmen who fought the Japanese suicide pilots in World War Two. In May 1945, with victory in Europe established, the war was all but over. But on the other side of the world, the Allies were still engaged in a bitter struggle to control the Pacific. And it was then that the Japanese unleashed a terrible new form of warfare: the suicide pilots, or Kamikaze. Here, he talks about the unique research process behind the book. a visit to the national archives in southwest london is a treat. a vast building by the river thames in leafy kew, it is an aladdin's cave of historical information which often reveals its most exciting secrets when you're least expecting them. while the staff have done a tremendous job of cataloging many of the records, individual reports or nuggets can remain hidden. their discovery may lead on to hours of detective work, an adventure to dig out more gold dust, which, with luck, allows one to join up the dots of a particular story. the next step is putting the meat on the bones. the advent of the internet and email — and the willingness of the older generation to embrace this form of communication — has meant many computer savvy veterans in their late 80s and 90s are now just a click away, triggering one of the most rewarding and magical aspects of my research for the kamikaze hunters. there is something extremely special about reading a contemporaneous action report and being able to immediately contact named individuals within it (or sometimes actually written by them) via email to get their thoughts 70 years after the event. very often they had their own logbooks or other primary resources to hand, shining a light or providing an alternative angle on the information in front of me, allowing me to verify, nail down or disregard stories. i would send off questions and very often have answers back within minutes. in other words, by using modern technology i had these men by my side. we become the research team. i hope this book will go some way to preventing that. it is their story, after all.